Available are views of the Agora, the City, St. Demetrius Church, and the Monastery of Vlatadon. 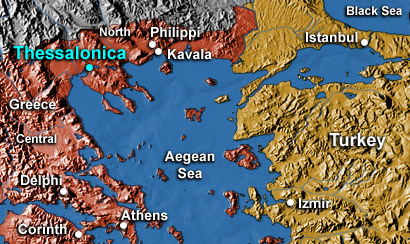 Thessalonica (modern Thessaloniki also called Salonika) is located 187 mi. [300 km.] north of Athens ("as the crow flies"). In the days of the apostle Paul it was the capital of the province of Macedonia and was a "free city." Paul visited the city on his second and third missionary journeys and wrote at least two letters to the church here. Today Thessaloniki is the second largest city in Greece (750,000) and most of the remains from the New Testament era are either destroyed or covered over by the modern city. However, recently excavations in the center of the city have revealed the remains of an ancient forum (agora). In ancient times Thessalonica was about the midpoint of the Via Egnatia – the famous Roman Road that ran for 493 mi. [790 km.] from Dyrrhachium and Apollonia on the Adriatic Sea eastward to Kypsela that is located east of the Hebrus River.